Route redistribution is a great way to share routes between routers running different routing protocols or routers running the same dynamic routing protocol but in different autonomous systems. 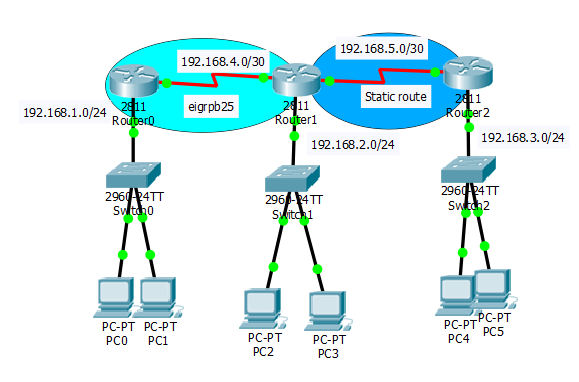 In this simple demonstration, using the Cisco Packet Tracer, I will share with us on how to redistribute static routes into an eigrp autonomous system. Let’s say your company has recently acquired another company that runs static routes on all its networks because not all their routers are Cisco routers and they are not ready for the complexity involved in running OSPF. Your task is to merge the newly acquired company’s networks with yours and ensure seamless communication across the networks while maintaining all routers. The solution would be to implement route redistribution on the border router to redistribute all static routes into eigrp. From the network topology above, Router0 and s0/3/0 interface of Router1 are in eigrp autonomous system 25 while S0/3/1 of Router1 and Router2 are running static route. Our goal is to make sure that even though Router2 is not running eigrp, it should be able to reach Router0 and vice versa. I will be back on Router1 to enter the command for redistribution after Router2 has been configured. At this point, we are almost done. The only problem is that Router0 has no knowledge of network 192.168.3.0/24. To achieve full connectivity, I will configure a static route on Router1 to reach network 192.168.3.0/24 and then redistribute this static route into eigrp autonomous system 25 so that Router0 can then learn about it via eigrp. See command below. 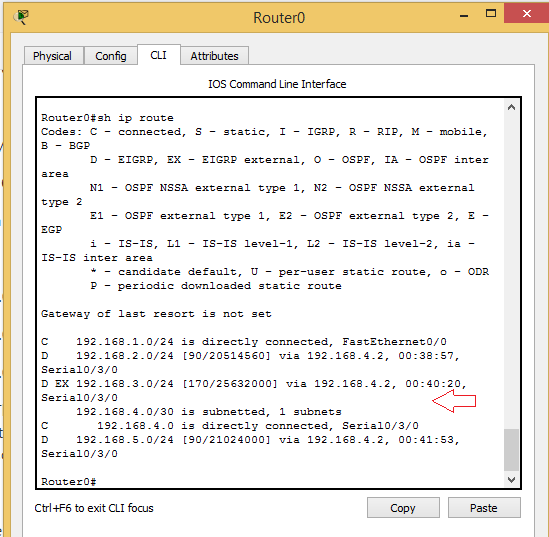 Now let’s look at the routing table of Router0 with the show ip route command. See image below. That’s it guys. To get the Packet Tracer file for this LAB, kindly drop your email address in the comment box. Cisco CCNA: Implementing EIGRP with VLSM and manual summarization. See all eigrp show commands and their functions. Protecting network stability with Spanning tree root guard. Kindly check your mail for the file as requested. Hi, the requested pkt file has been sent to you.